So, here's my question this week. What are baby shoes for? Does my child really need them or are they simply a ploy to make me spend more money? Also, why do people care to point out that my tiny baby, who is probably a good few months from walking, is not wearing any shoes? 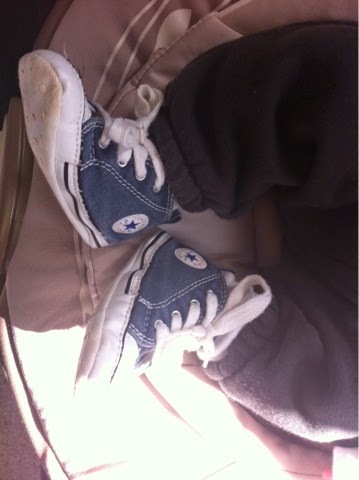 And finally, when one does succumb (read: remembers) to put on said baby shoes on, how do you keep them on? How on earth do you keep shoes on feet for longer than a few minutes? I know: it was meant to be one question and we've ended up with lots. But really, seasoned parents: what are baby shoes for? No need for anything except socks, mine did have some soft leather elasticed little pull ons so that they wouldn't pull their socks off. It will be getting warmer there soon so I wouldn't bother. One point of view to keep in mind- don't always listen to everyone do what you think and want. Especially in summer, baby shoes are nothing more than decoration. And god help you with the keeping them on thing. Even when it's frigid out there they'll whip 'em off and throw 'em overboard as you walk down the street with the stroller, leaving a baby-shoe trail behind you. And yeah, you really have to just ignore the "tha krionei" little old biddies.